You think you are biting into a juicy piece of meat until you realize, this is just a mushroom. My meat-mushroom! We are on our second week of no meat(no fish, no chicken, no nothing!) It really is working out well, however, keeping fresh veggies on hand presents a few problems. I am trying my best to limit trips to the grocery during the week...keeping my green responsibilites to a minimum....anyway, I have several recipe books in the store now and Maxine Clark's came to mind when thinking about what to serve for dinner tonight. In her Easy Italian-simple recipes for every occassion, she has given us a number of delicious recipes using the best and freshest ingredients producing several outstanding dishes for busy people. Anyone busy these days? 2 T.olive oil, extra for brushing. 3 T. chopped fresh parsely. 1/2 cup black olives, pitted and chopped. A pinch of ground hot pepper. 3 T. freshly grated Parmeasan cheese. Remove the stalks from the mushrooms and chop finely. Heat oil and add mushrooms, garlic, olives and parsley. 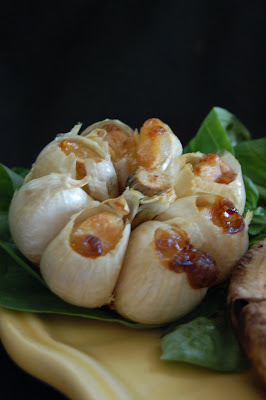 Saute gently to soften garlic. Remove from heat and add tomatoes, red pepper, salt, pepper and gently stir in ricotta. 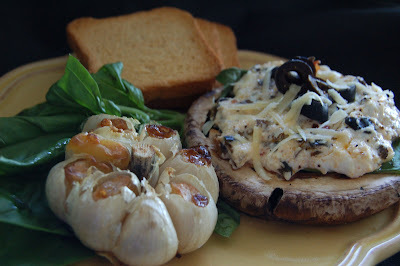 Brush the mushrooms with the olive oil and top with the ricotta filling in loose mounds. 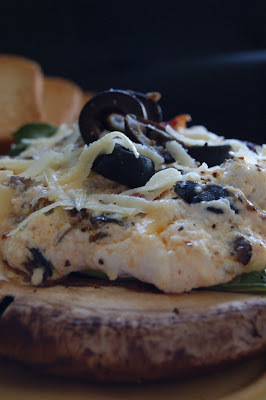 Sprinkle with the cheese and bake on tray in a preheated oven at 375 degrees for 15-20 minutes. Serve immediately. Serves six. I added a special treat for myself-threw in a few heads of garlic! One of my dear friends, now living in Clearwater, invited hubby and I over for dinner a number of years ago. She prepared a dessert that I have been able to reproduce many times and it always comes out as delicious as the first time I tasted it. The recipes is actually from the California Strawberry Commission and was featured in a local magazine. I don't know the name of the magazine, as she just made a copy for me. Anyway, tonight was the night I decided we needed a great dessert-we have been cutting way back lately- I had frozen strawberries in the freezer from this season and thought I would use these instead of the fresh. Our season is now over and the berries really are not as tasty as they were last March. 2 cups (12 ounces) sliced, stemmed berries. To make the Amaretto Strawberries, in bowl, gently stir all ingredients together to dissolve sugar; refrigerate covered, up to 3 hours. To make Ricotta Souffle, heat oven to 375 degrees. Generously butter a 4 cup souffle dish; coat with sugar, shaking out excess. Using electric mixer, beat cheese, sugar, 3 eggs and 1 egg yolk, bread crumbs, flour and extract until throughly blended. In a small bowl, beat remaining egg white until stiff, but not dry; gently fold into cheese mixture. Pour into greased dish. Bake in center of over for 40-45 minutes or until puffed and lightly browned. Cool on rack at least 5 minutes or up to 1 hour. Loosen the edges with knife and invert onto serving plate, (which I did not) with wide rim so you can arrange the berries around the souffle. Sprinkle with confectioners sugar. Serve with Amaretto Strawberries. Less than a year since visiting Lhasa, the city has been turned upside down. I am posting these photos to give you some perspective of a normal day..... people going about their business, shopping, praying, buying french fries, selling their wares, talking to strangers, doing all the necessary things that people do everyday just to survive and live. It only took a short visit to comprehend that Tibetan life is difficult...... and now, more so thanever. Anyway, let me share a delicious recipe from Whole Foods in celebration of being back on line again. When I travel to Seattle, this is one of my first stops. Living in central Florida, few stores exist like the Whole Foods in Redmond,WA. If you have shopped there, you know what I mean. My curiosity gets the best of me to see what is new, plus getting my "fresh food visual fix." Love just strolling through the isles taking it all in. However, during a recent trip to Sarasota, this little fella (tart) was in the frozen food section imported from France! I bought the one you are viewing. This recipe was adapted from the stores file! I took the tart home and placed it on special piece my mom gave me- she loves this dish...still tries to take it back! Hope mine turns out as beautiful! 3 T. butter, cut into tiny pieces. Place the salt, sugar, baking powder and flour in bowl and combine well. Add the butter and mix with electric mixer until pieces resemble fine powder. Add the eggs, one at a time and mix well. The dough will gradually clump together. Shape the dough into a disc and chill for at least thirty minutes. Combine the almond paste, one egg, and sugar in bowl. Mix until smooth. Add butter, vanilla and continue to mix. Add the flour and baking powder. Add the remaining egg and mix until smooth. Cover and chill thirty minutes. Roll out pastry on a floured surface and press into a 12 in. tart pan with removable bottom. Press the pastry into the edges and up the sides. It helps to extend the pastry above the rim of the pan to keep it in place while baking. Roll over the top of the pan with a rolling pin to shear off extra pastry. Don't forget to prick the sides and the bottom of the pastry before baking. Spread the almond mixture over the pastry. Use the back of a spoon to spread it evenly. Place the pears evenly around, pressing them slightly into the dough so that the almond filling will puff up around the pears. Place the tart on a baking sheet and bake for 45 minutes or until golden brown. Cool and then carefully remove the bottom of the pan and place on serving dish. Serve at room temperature. Serves six. And, a peak of what has been going on here in Florida at the shoppe!